all4cycling are dedicated to providing quality infrastructure products for Australia and New Zealand. Their trade mark custom designed vending machine for end of trip facilities and high quality range of public bike pumps, bike repair stations, custom bicycle parking and much more, coupled with their professional back up service makes them Australia and New Zealand’s leading cycling infrastructure supplier. Using existing branding the all4cycling crew wanted a clean fresh design that would clearly showcase their brand promise. We designed and developed an informative website in Orbit CMS which includes a robust e-Commerce solution that displays perfectly regardless of the device. 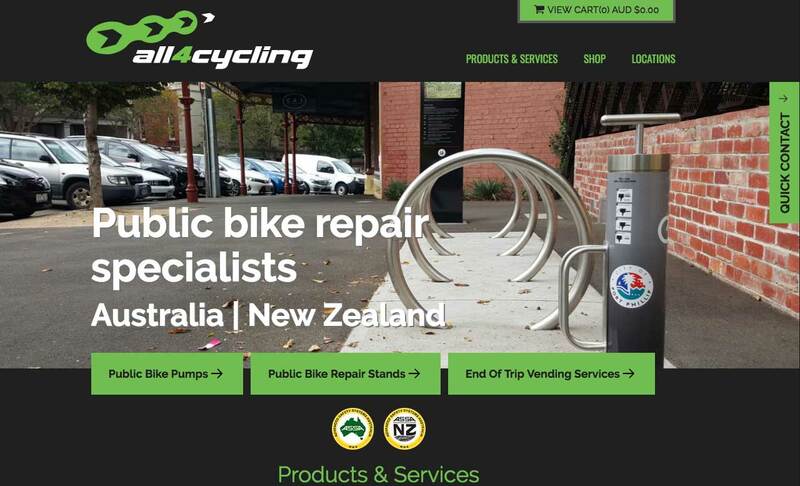 We currently work with all4cycling.com.au on the on-going digital marketing of their website to improve their online visibility and grow their website traffic. Having had a less than positive experience with another provider, we commissioned Apex to re-design and develop our website. Apex took time to understand our exact requirements and turned a previous poor experience into an enjoyable one. They provided a well-structured website intended to inform users of our bike service locations along with our large range of high quality “end of trip products”, promote our vending machines, and built a robust e-Commerce solution to help us sell our products online. Orbit CMS is extremely flexible and simple to use; and with the subscriber model we can rest assured knowing we always have the latest e-Commerce functionality installed. Apex are now focussed on improving our online visibility with a targeted digital marketing campaign. We highly recommend Apex – they have a basic desire to make a positive difference to their client’s businesses through the delivery of excellent online services.